The A-10 Thunderbolt II also known as the “Warthog” is the first Air Force aircraft specially designed for close air support of ground troops. They are simple, effective and survivable twin-engine jet aircraft that can be used against all ground targets, including tanks and other armored vehicles. The A-10 emphasis is placed on the ability to operate from short unpaved airstrips and to withstand prolonged exposure to ground fire. The A-10 was a reaction to Vietnam. It has excellent maneuverability at low air speeds and altitude, and are highly accurate weapons-delivery platforms. They can loiter near battle areas for extended periods of time. Using night vision goggles, pilots can conduct night missions. The aircraft can survive direct hits from up to 23mm projectiles. The pilot and parts of the flight control system is protected by titanium armor. The A-10 was first flown on 10 May 1972, and the first production model was delivered in October 1975. A total of 715 aircraft were built and 327 of these aircraft are still in the AF inventory. 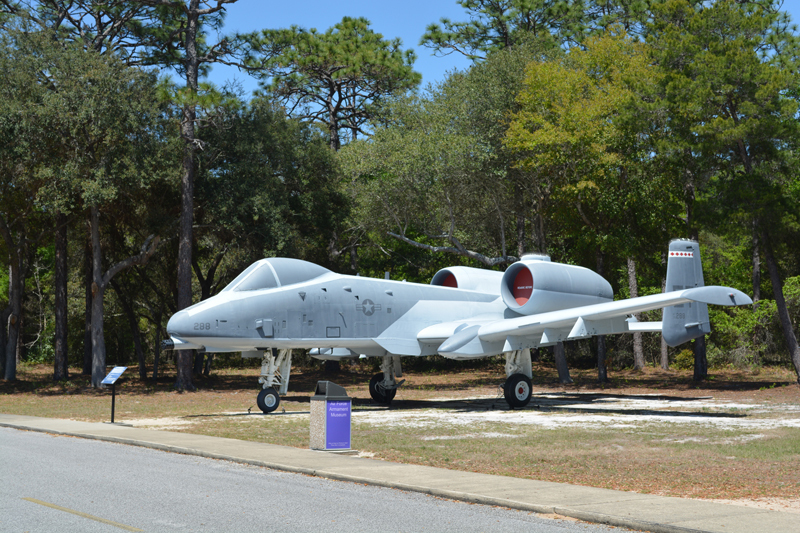 The A-10 flew in the Gulf War with a 95.7 percent mission capable rate. This A-10A S/N 75-0288 was last assigned to the 355th Tactical Training Wing at Davis-Monthan AFB, AZ. It was manufactured by Fairchild Aviation Corp. and delivered to the U.S. Air Force on 24 Mar 1977. It was delivered to the AF Armament Museum for static display on 01 Feb 2001.